It’s the go-to metaphor whenever a writer wants to say “yet another heroic/futile/suicidal gesture (based on flawed information and incompetent leadership) ending in no gains and high losses”. Here are a few more. “Fear can backfire: The primary strategy of the Remain camp may also be incurably faulty. Everything from them has been about manufacturing fear, be it talk of falling economic growth and rising unemployment, to talk of house prices decline. The last of course is aimed at British middle class voters who are considered (perhaps for very good reasons) to be romantically attached to the market value of their properties. “The British are not generally prone to martyrdom. However, whenever they embraced it, their literature celebrated it. Take the charge of the Light Brigade, for instance. 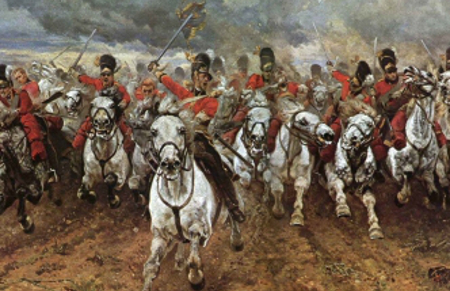 During the Crimean war in the nineteenth century, six hundred brave British cavalrymen rode themselves to self-destruction. That happened because a commander had issued an erroneous order. Alfred Lord Tennyson penned a paean of praise to that act of valour in a famous English poem. For that reason the unfortunate event has been indelibly etched in history. But the action itself was quite meaningless. It made no military or strategic sense. “Never in modern history might millions have stronger cause to reflect on the old caution about being careful what you wish for. The language from politicians and pundits on the BBC as dawn approached – the talk of emergency measures and possible suspension of the stock market – was language you’d more normally imagine hearing on the outbreak of war. Which seemed apt. But what of the genius military strategist who led us into the most suicidal manoeuvre since the Light Brigade charged on and on with heroic futility, and into the Valley of Death? With the future of us all suddenly in peril, speculating about one man’s immediate future seems almost too banal to be worth deploying as a diversionary activity from the horror. There are many more examples – do let me know if you come across any good ones. PS If you want to know what connects Light Brigade-historian Terry Brighton, the number of the Beast of the Apocalypse, the Heavy Metal band Iron Maiden, a pair of identical twin harpists, and a bottle of beer”, please sign up to this blog. This entry was posted in Charge of the Light Brigade and tagged Brexit referendum by Philip Boys. Bookmark the permalink.